Learning refers to the content to be learned by players through the game with specific and measurable learning outcomes. Storytelling refers to the background story of the game and includes a description of the character(s), the setting, and the ultimate goal of the game. Gameplay refers to the way in which the player interacts with the game, or with other players (if a multiplayer game). It encapsulates the type of activity (e.g., puzzle, trivia, etc.) found in the game. 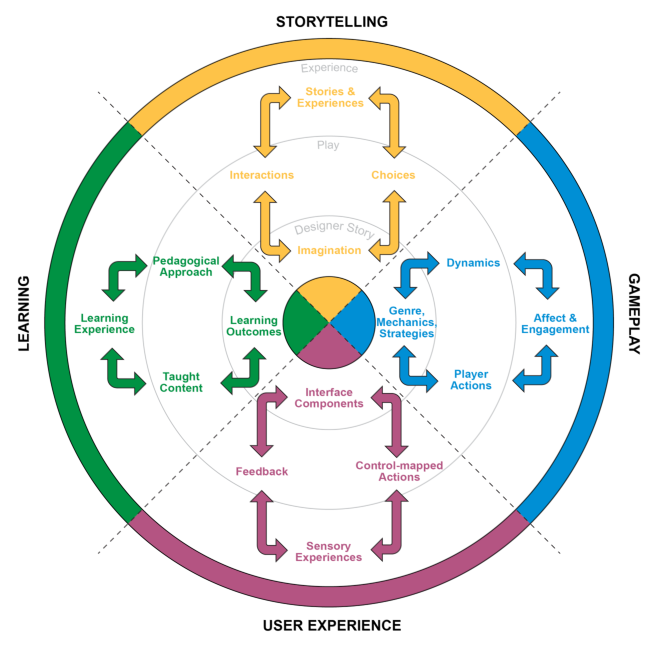 User Experience refers to the player’s emotions and attitudes while playing the game, as well as how the player interacts with the game. The innermost Design layer symbolizes the designer’s “story,” or all the elements that the designer introduces to the game that will allow the player to play the game. According to Winn (2009), the designer has direct control only over the design. The middle layer, Play, which symbolizes the “mediated experience” between the player and design input through play, is influenced by the design and the player’s background brought into the play experience. The outermost Experience layer symbolizes the varying play experiences that players can have depending on their backgrounds, as well as the choices and actions made during game play. Figure 2. The Art of Serious Game Design methodology circle.